I’m writing from my hotel room in Akka, Israel, not far from Mount Carmel – the site where Elijah defeated the prophets of Baal. My wife and I actually visited that site today. Remarkable! We’re part of a clergy study tour group, led by a friend and colleague of mine who has much experience and expertise in so doing; it was great for us to be able to get ourselves to the airport in Toronto and consign ourselves to his care, without a worry of our own, for the 8 days we will be away. One of the things that I noticed right away on our flight was the disproportionate – though not surprising – number of Jewish people aboard. It was the first day of Hanukkah, so presumably, some folks were coming to Israel to celebrate the Festival of Lights. Several of our fellow passengers were Rabbis; it was fascinating to watch them rise with the sun (which happened early, since we were travelling eastward), put on their prayer shawls and phylacteries, and offer their morning prayers, facing Jerusalem. There is a sense in which watching these men in their very public devotion and dedication encouraged me in my own “public display of affection” toward the Lord. Of course, Jesus told us to pray in secret (Matthew 6.6), but too often, we offer no indication that we have a life-changing faith we practise. How can you display your affection for God in these days? 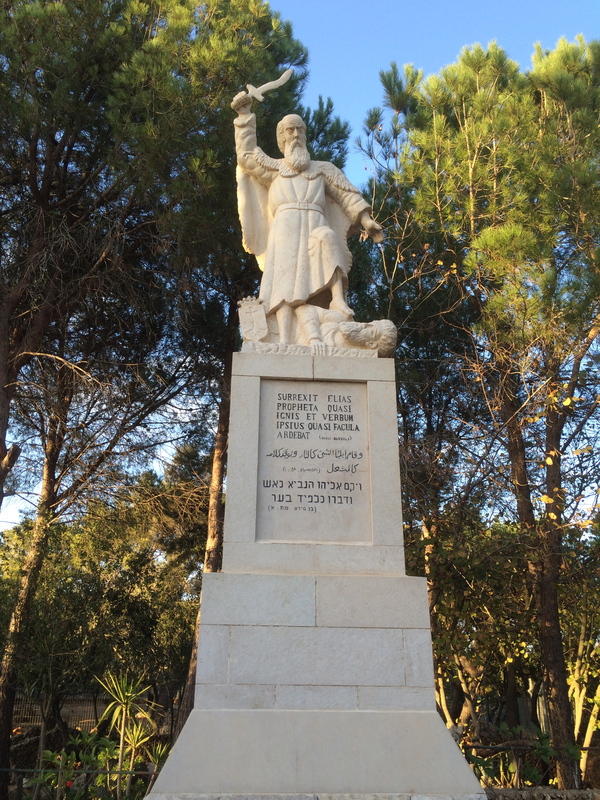 When visiting Mount Carmel, I was reminded of the story in 1 Kings 18 of the time the prophets of Baal, a false god, were teaming up with Ahab and Jezebel, the king and queen, to discredit Elijah and bring disrepute to the God of Abraham, Isaac and Jacob. God showed his power by sending fire from heaven not only to consume an offering, but to soak up all the water that had been poured on and around it. It really was a remarkable story, and a remarkable scene to stand at. We were shown the place where Elijah killed those prophets. The very spot where the showdown took place has been, for over 150 years, the site of a monastery, in an order named for its location: a Carmelite community. There still are monks there today. What if we brought these two ideas together? What if we displayed our affection for God through a demonstration of his power? It wouldn’t have to be fire from heaven; it could be something as simple as loved shared where it seemed least likely, or a hand offered in the midst of a busy life. It could also be something decidedly flashier, but it wouldn’t have to be – it would just need to be consistent with who you are in Christ and how you serve him faithfully. So what power will God demonstrate through you? “You are the God who performs miracles; you display your power among the peoples” (Psalm 77.14).